High Quality Operation Theatre Tables. We can supply in neutral packing also. We offer high quality operation tables that ensure easy access to the patient and complete safety during operations. These tables offer required flexibility with various adjustment levels. Our range of operating tables feature ergonomic design with headrest and wristband for greater stability and balance.A versatile operating table that offer great flexibility in positioning combined with ease of operation. These tables provide comfortable adjustment with side handles and have large perennial cut for drainage. Our range of operating tables are specially designed for complete comfort of patients and ease of operation for surgeon. 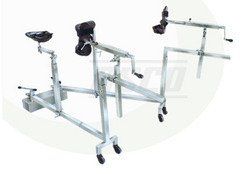 These tables have easy control for the adjustment of height and headrest as per the patients as well as adjustable wrist support that provides excellent stability during the operations. Our range of operating tables have a stainless steel frame that makes it highly durableThe C-Arm compatible gearmatic operation table can be used for all major surgeries including orthopedic, urology, neuro-surgery, gynae and general surgical procedures. 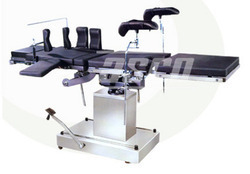 These tables have unique C arm design for comfort and stability of the patient during the operation. An all-in-one operation table which can be used for all major surgeries including orthopedic, Urology, Neurosurgery, Gynae and general Surgical procedures. Five Section Radiolucent Table Top. Its special design allows ability to use C-Arm over the length of the table. Control of Height, Trendlenberg, Lateral Tilt and Back Section can be done entirely by fully Gearmatic Force. All major Positions of the table are simply effected by crank operated in the head End of the table. Foot Pedal Operated Height Adjustment with Four Cylinders Hydraulic Pump. Base and Column covered with Stainless Steel Fitting for Hygiene and Durability. Leg Section and Head Section Interchangeable. We offer a broad range of operating tables that provide easy and comfort for patients and ultimate stability during the operation. These tables feature ergonomic design along with different adjustment levels. The adjustable cushioned headrest ensures patient comfort and restraint during operations. 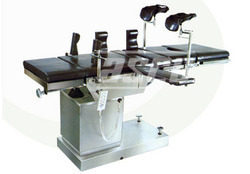 Our range of operating tables are available in variety of specifications as per client's requirements. 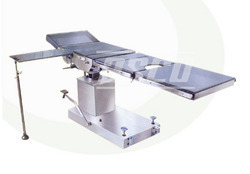 The electro-hydraulic compact mechanism of the remote controlled operating table guarantees high operation safety and accurate patient positioning. Electrically operated, these tables are ideally suited for all major and minor surgical procedures. State-Of-Art Electrically Operated Versatile Operation Table for all major and minor surgical procedures. Fully manoeuvrable by Soft-Touch Keys on Hand Held Remote Control Panel. Legible and easily identifiable symbols on switches provide correct selection of Table position at any stage of operation. Provides for smooth, easy and accurate positioning. Unique, sensor-controlled levelling for height adjustment, backrest lifting, Lateral and Trendelenburg position. Equipped with Mechanical Foot Pedal Operated Base Locking Mechanism for firm and rigid locking of the table. Head section and Kidney Section are mechanically operated having easy and smooth movements. We offer specially designed orthopedic extension devices, which do not require any attachment with operating table and are totally independent of operation tables. Manufactured with superior quality raw materials, these operation table attachments are very user friendly as the height and position of the device can be easily adjusted depending upon the place and treatment of injury. These additional operation table fittings conform to international quality and safety standards and are available at very reasonable rates. Our range of orthopedic extension device for operating table accessories are manufactured using high grade non magnetic steel with improved resistance to corrosion. These accessories can be custom designed to fit all table models. Specially Designed for Intra Operative X-Ray Photos and Image Intensifiers use. Removable Pelvis Rest and X-Ray Translucent Pelvis Stem. Stirring Instruments allow Flexion/Raising of Legs and Stirring Ball Joint Locked from Foot End. Two Traction Devices On sliding Spot with Ball Joints Allowing Flexions and Rotations of Foot with Traction Shoe. Padded orthopedic knee Crutches provides support to the legs of the patient. Requires Small Storage space as it is easily collapsible. Our range of operating tables features great flexibility in positioning combined with ease of operation. The design of the table gives automatic adaptation to the body and highest level of comfort to the patients. These tables have a rigid steel frame that makes it very stable during the operation. Table Operating- Side End Control Double Hydraulic Cylinder. These tables feature unique design with a radiolucent table extension connected to cantilever for supporting the head and upper torso of the patient. This makes for the perfect positioning of the patient during operation and X-ray imaging. 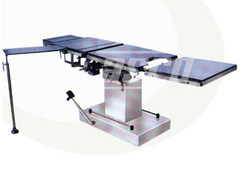 Versatile Operation Table for general surgical procedures. Five Section Radiolucent Top for X-ray Imaging. Equipped with Base Locking Mechanism for firm rigid locking of the table. Interchangeable Leg and Head Section.